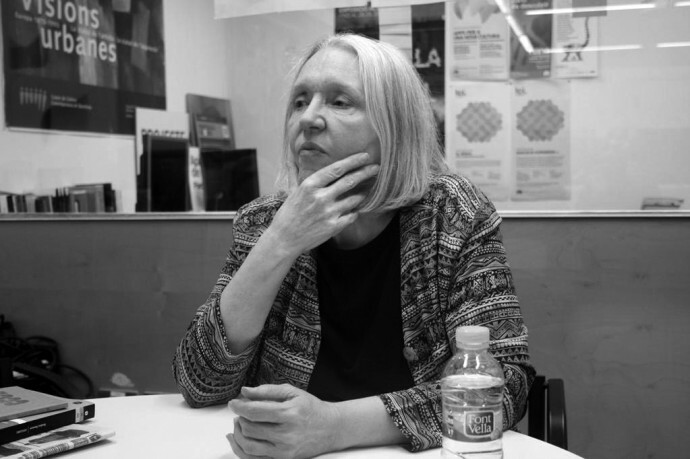 Saskia Sassen is Robert S. Lynd Professor of Sociology at Columbia University and a member of its Committee on Global Thought. Her most recent books include Territory, Authority, Rights: from Medieval to Global Assemblages, Cities in a World Economy, and Expulsions: Brutality and Complexity in the Global Economy; among others. When she came to Barcelona to give a lecture at CCCB as part of the debates ‘Justice and Equality,’  we had the opportunity to interview her about public space, politics and the city. Quaderns: If in the previous issue of Quaderns we related domesticity and politics, analysing how the small scale of the domestic is directly connected with macroeconomic factors, in this issue we are placing the focus on the urban scale. From your viewpoint, what role is played by the public space? Saskia Sassen: When we talk about public space we do so about quite a formalised historical category, the very notion of public space is completely established in the very way in which we think. In this sense, the idea of public space in Europe means something very specific, it has very particular connotations. When we talk about the European public space, we think about a very important common asset, but at the same time we see how that space contains certain incrusted logics and codes that, as our cities become bigger and more heterogeneous, ultimately convert it, de facto, into a somewhat exclusionary element: the public space often makes reference to our customs, not to other customs. In that sense we need something more than that public space that is already recognised, respected, built and ideologically charged. Perhaps, the public space suffers from being overdetermined. We need other categories. In this aspect I am extremely interested in the idea of indeterminate space. Everyone should be able to recognise themselves in it. Let’s focus, for example, on a critical subject: the powerless, the discriminated, or the importance of having indeterminate spaces available for social movements, such as 15-M. Speaking of the indeterminate, I believe that the word calle in Spanish does not hold that same meaning that somehow is contained within the English word street. The word calle in Spanish evokes a certain elegance; street, in contrast, evokes a certain idea of informality. It makes reference to something that is not totally finished, something that is still emerging. The idea of street, understood in this sense, is very important. Q: Talking of street, you have often referred to the concept of “global street”. S. S.: “Global street” refers to the complex space of the contemporary city. In the “global street” the connections are built between the major political and economic powers and the domestic sphere, households. A clear example of this is what occurred between the years 2000 and 2005, when access to mortgages was actively promoted, encouraging debt – we cannot forget that credit means debt –. Thus, the global financial system starts to enter the modest world of domesticity and debt is precisely the mechanism for achieving this. The connection of the “global street” with the economic powers occurs through big capital, which gradually buys up bits of our cities, which it often does not even develop, so often the city becomes simply another form of capital accumulation. However, it is also the space of those groups of people that we habitually call the invisible, the powerless. I always say that the city is the space in which those powerless people can make history. I would say that the street, in the English sense that I mentioned previously, is differentiated from the classical European notion of more ritualised spaces. Street and Square are different – even from the viewpoint of their political reading – to the piazza and the boulevard, perhaps two of the most emblematic elements of European public space. The street, conceived in this way, more than a space in which to represent ritualised routines, is a place in which new forms of the social and the political can appear. Q: You have just presented in Barcelona a book that is titled ‘Expulsions.’ Undoubtedly in many cases these expulsions were originated by that debt mechanism you referred to. What is the role played by the economic powers with respect to those kinds of situations of social expulsion? S. S.: To talk about that we can take an example familiar to us all, the World Economic Forum meetings in Davos. The aim of these meetings between the major economic powers consists of constructing a cultural context so that the economic, political and media elites of the world alike, accept the neoliberal and privatisations model. The Davos Forum meetings become dangerous, because they manage to present any issue under a new narrative, with the aim of deactivating it. For example, the theme of the last meeting was inequality. All the groups with economic power accept that it is an important issue to debate. And it is here that these meetings become dangerous, because they focus on the cultural generation of a new narrative – and a language – that make it acceptable. Inequality is no longer presented as such, but described in their own terms. Thus, situations of social expulsion are created while, conversely, the message is transmitted that work is being done to solve the problem. We are living in extreme times in which the condition of “expulsion” is becoming invisible, because our categories – we are coming back here to Davos and the creation of a language – cannot take in these extreme times. We live surrounded by an entire series of invisibilities, conceptually speaking. Q: The abuses of tourism, as in some cases that have arisen in Barcelona, have also produced small-scale expulsion logics. What is your diagnosis? S. S.: To talk about the city one has to distance oneself until it is lost from view. The city is a complex but incomplete system, and therein lies its capacity to continue inventing itself over the course of the centuries, to capture momentary histories, outsurviving kingdoms, governments, or powerful companies. Nothing in our history has lasted as long as the city. In this sense, the city cannot only be defined based on a factor such as density. For example, a megaproject may be very dense, but it does not construct city. That same logic can also be applied to tourism, mega-hotels and major infrastructures deriving from them: they do not necessarily construct city. Q: When we reflect on the relationship of the public space with the political, we see how, in recent years, the focus has been placed on new technologies. However, it seems that it is the public space, and the fact of sharing a place, that has allowed people’s discontent and dissent to emerge – or at least to become more visible – as has occurred in many of the protest movements of recent years. What is your view? S. S.: Boston has a terrible climate, therefore in its streets, potholes keep appearing in the road surface. To solve this problem, a group of residents developed an application with the aim of pinpointing the potholes and reporting their location to the local council so that, this way, staff can be sent out to repair the street. The project is called Fix my street and it is based on the knowledge that citizens themselves have of their neighbourhood, their locality. A knowledge that exceeds by far that which the experts may have, often subject to the centralised view that frequently dominates city management policies. This is only a very modest example of how to use new technologies and open source language (you can see my article “Open sourcing the neighborhood“) and make them converge with the public space. In this context, the 15-M Movement can be understood as the first step on a trajectory that concerns us: we are all important for the city. That is why today it is so vital that new organisations – like Podemos – use new technologies to activate participation, or to debate on very specific issues. In parallel, the public space plays a very important role when reinforcing the neighbourhood fabric, which is a determining factor in recovering local economies and moving away from the economy of the banks, because the banks base their strategy on extraction. Q: Following the global city idea, what are the systemic factors that are arising in the construction of the public space? S. S.: We are living through a very special time, there is generalised exhaustion. While Syriza was taking power in Greece, Madame Christine Lagarde was saying publicly that the IMF was going to work with Syriza, contradicting in a minimalist and elegant way the intentions of the German government. At the same time, the head of the European Central Bank admitted that the European austerity programme had not worked. This set of contradictions reveals a search for change and, in the case of various countries in Europe, new politics are emerging from meetings in squares, in public spaces. Every complex condition that exists is partial. But its partiality allows me to enter into a discussion that is closer, which is that which makes it possible for people to unite and fight for a common cause. That is why it is important that in Spain a political party like Podemos has been born. All these aspects emerge from the public space but, when creating relations, they also in turn create public space. For example, in Spain an economic space exists that is incredibly distributed, where every locality has its traditions and these traditions include distributed economies. Economies that employ people and that in addition maintain cultural elements and are based on local production, such as clothing, olive oil or cheese. Q: Previously you have referred to the dangers of the instrumentalization of language, to the problem represented by naming something. This issue is titled ‘Atlas of Political Clichés,’ which undoubtedly concerns language and the recurring use of certain terminology -or concepts- and their pitfalls. What do you believe is the importance of language? S. S.: The vast part of the vocabulary used nowadays has no power. Sometimes we use politically correct terms as an invitation not to think. The categories that one uses to think are very powerful, they concentrate a large amount of information, of historical connections of all kinds, such as “the State”, the “middle class”, etc. We must rethink these categories. That is why a need exists to extend the conceptual space beyond the social world. To question language: not accept “climate change” but “dead lands”. This is the only way of avoiding manipulation of the message and managing to assume responsibility for our actions. —Interview conducted in February 2015 by the editorial team of Quaderns, Ethel Baraona Pohl, Guillermo López, Anna Puigjaner, José Zabala.